The intercooler in the '13-'18 Ram Cummins Diesel trucks is now located beneath the radiator rather than behind it like the '10-'12 trucks. 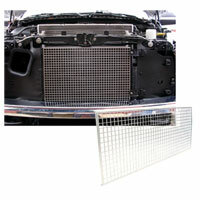 This intercooler guard is similar to our condenser guard and protects the intercooler from damage by road debris. This 16 gauge steel guard with 1/2" perforated holes is powdercoated so it has a durable finish that is abrasion resistant and has maximum airflow. It will need periodic cleaning to maintain the finish, but otherwise it should be long lasting. If you already have the A/C condenser guard in your truck, you can add the intercooler guard.